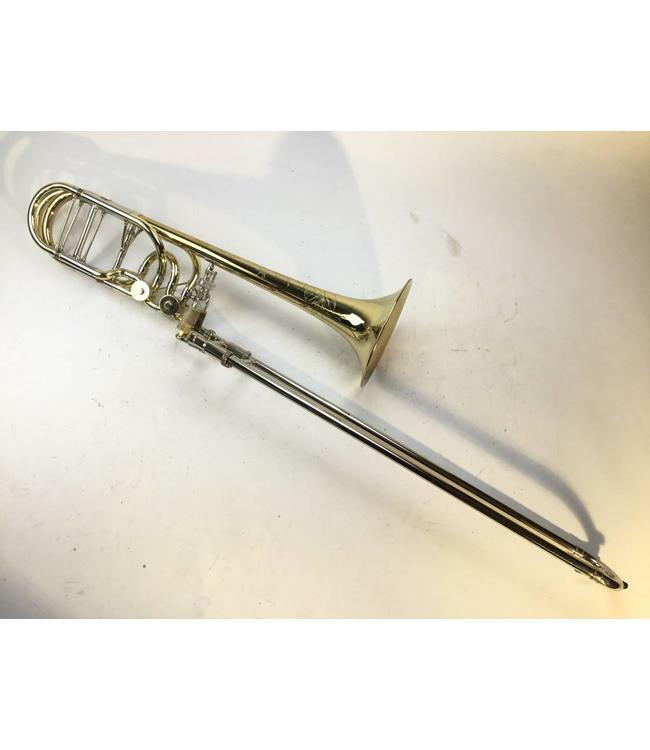 Used Shires Bb/F/Gb/D double trigger tenor trombone. Instrument has a 8 inch 1YM8 bell with older style engraving. It has a rose brass "s" tuning slide, an independent standard rotor valve section, a T47NLW hand slide, and a 1G leadpipe. The condition of the instrument is good apart from small dings and scratches in the bell flare, with a small acid bleed at the bell rim. The knuckle going into the first valve (f attachment valve) has been damaged and repaired at some point. The slide has scratches and and lacquer wear on the outer tubes of the slide. Comes with gig bag.